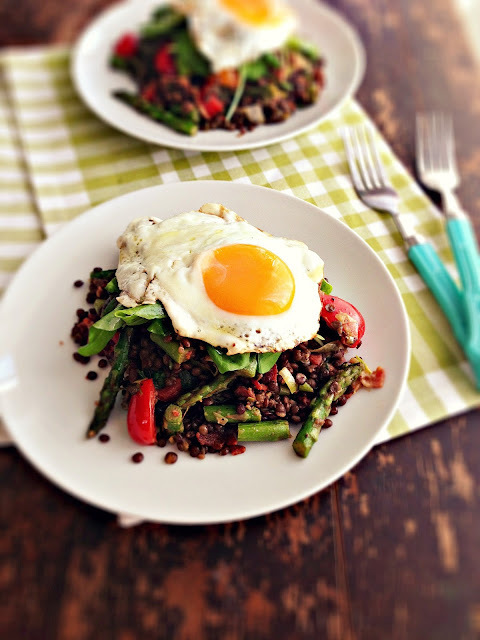 This is a sponsored post, but there is no shortage of love for lentils on these pages. And you guys know me - I wouldn't tell you about something unless I really was in love with it. So here we go! First things first. May is Love your Lentils month (but I'm crazy about them the whole entire year - just scroll through my recipe index and you'll find the love) and to help celebrate Canadian Lentils has created a really fantastic contest. Here's the part where I tell you about the good stuff: the grand prize is a trip for 2 to Saskatoon, Saskatchewan (my hometown!) and the heart and soul of the world's lentil production. We love our lentils here. Not only will you get to hang out in my beautiful city, but also take a tour with famous chef Michael Smith, stay in a posh hotel by the South Saskatchewan River for 3 nights, and you get $500 to spend on fun stuff while here. All you have to do is enter your lentil recipe - you can be a blogger or a home cook - and just by voting you have a chance to WIN. I won't bother you with all of the particulars - you can read them here. But I urge you to enter, and while you're there, throw a vote my way too, because I really, really want to stay in that hotel (and meeting Michael Smith wouldn't be too shabby either. Oh, and the cash, yeah, the cash, that would be nice. And I've got a hankering to tour a farmer's field like nobody's business.) So go vote! Pretty pretty please and thank you. Just what the heck are you voting on...well let me tell you. 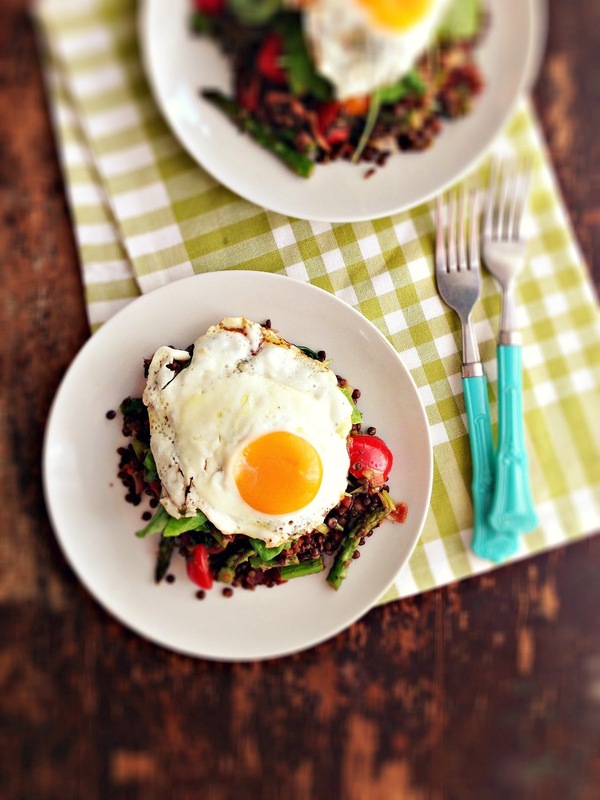 I created this lovely warm lentil salad, and the secret ingredient is bacon fat. Isn't it always? 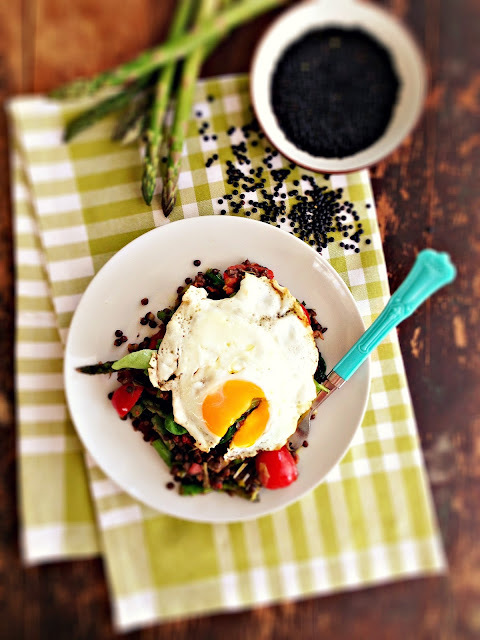 The starring role goes to beluga lentils or those pretty French du Puy lentils, but the plain green lentils will also suffice. The name of the game is to pick a lentil that holds it shape while cooking, so absolutely no red lentils, okay? Save those for soup. Lentils cook so quickly - in about 25 minutes - leaving you time to prep the rest of your ingredients. You can seriously come home from work and throw this together last minute like. In a busy kitchen, hell, a busy life, the lentil is your friendly nutritional powerhouse and meal-planning savior. We like! Bacon is fried, driving everyone in the house insane by the smell. My cats get shooshed outside whilst this is happening. There's only so much clamoring for bacon fat in the house, and it's all mine. When the bacon is finished cooking, drain it on paper towels, then add the sliced leeks and asparagus to the skillet. Oh Lord. That smell is the best. When they are nice and sauteed, they get added to the warm cooked lentils, along with cherry tomatoes, fresh basil and apple cider vinegar. It seriously all comes together in about 40 minutes. Not bad for a hearty, nutritious breakfast, lunch, or dinner. We like versatility! Now for the fun part. That same skillet that first cooked the bacon, then the veg now cooks the eggs too. We like not having to do dishes around here. Divide the salad onto plates, top with fresh and peppery arugula and a fried egg - you want it just so the whites are set and the yolk still runny. 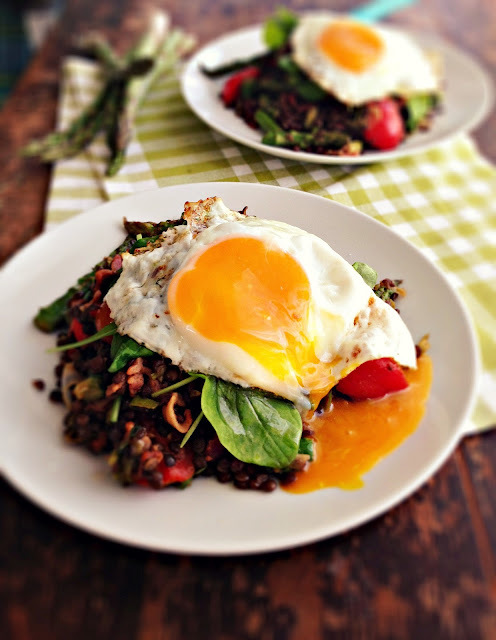 When that golden goodness combines with some lentils and bacon, you will swoon. I promise. Be sure to drizzle your eggs with good olive oil and a smattering of salt before you tuck in. Eggs + olive oil + salt = forever. This salad is uncomplicated comfort food, but tastes sorta sophisticated. You could close your eyes and pretend you're in Paris. Or enter this contest (and vote for me too!) and win a trip to Saskatoon. Good luck! Put lentils in saucepan and cover with plenty of cold water. Bring to a boil, cover and simmer for 25 minutes or until tender. Drain, put back in pot and cover with lid. While lentils are cooking, fry bacon in skillet until crisp. Drain on paper towels and chop, reserving all of the fat in the skillet. Add the sliced leeks and asparagus pieces to bacon fat, sauté until tender, 7 minutes, stirring often. Add the warm lentils to a large bowl. Stir in the chopped bacon, cooked leeks and asparagus, tomatoes, basil, apple cider vinegar, salt and pepper. Adjust the seasonings. Heat the skillet again. If not enough remaining bacon fat, add a little butter. Fry the eggs (you may need to do this in 2 batches) until the whites are set and yolk still runny. Divide the warm salad onto 4 plates. 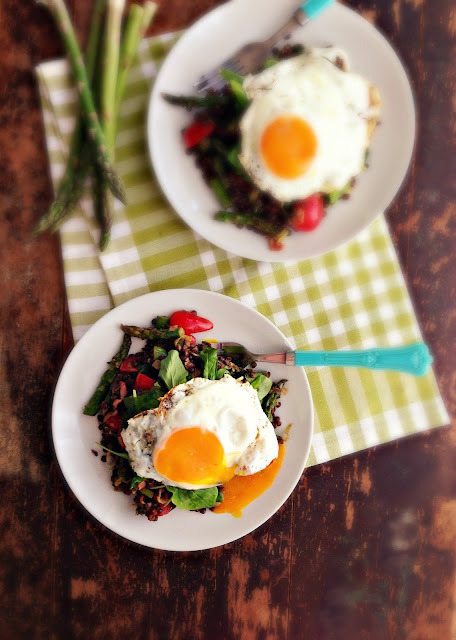 Top each with 1/2 cup arugula and a fried egg. Drizzle each with good olive oil and a sprinkle sea salt. Eat immediately. Makes 4 servings. Looks delicious! Good luck to you. Voted! 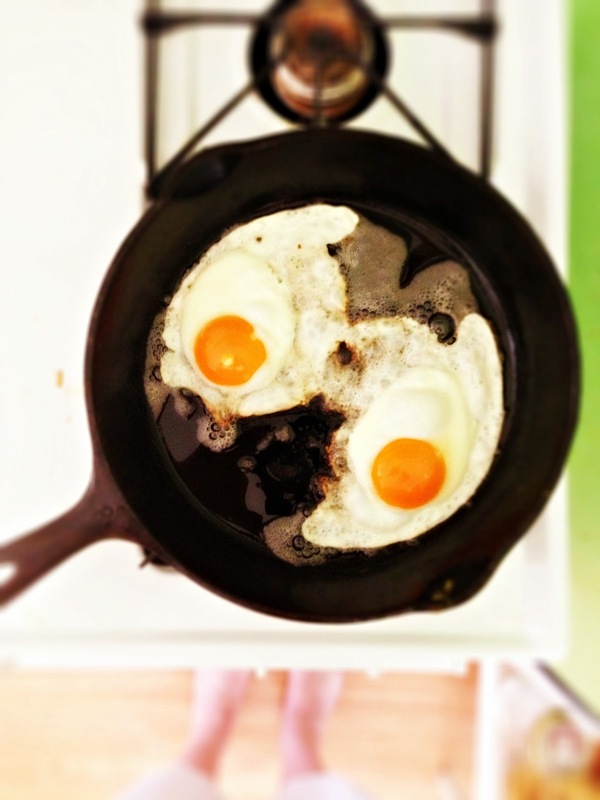 Fried eggs make everything better. Oh, bacon too. This combines all the comfort with the tastes of Spring Renee. Love the picture of the orange yolk oozing onto the plate! Recipe sounds delicious! I'll send a vote your way! The salad looks amazing. Years ago I went to Paris with my mom and at one of our first meals the waiter mixed together a salad of warm lentils and bacon fat at our table for us and then it was served family style. Delicious combo! Val - this really is quite seasonal and versatile. Stephanie - thanks lady! Jealous of your Paris trip - I need to go. Glad you had a happy lentil experience there! This is a perfect well balanced and healthy treat! Love the combination of flavors, very tasty. I voted. It was absolutely delicious, and easily the best looking dish on the contenders list. Thanks Renuka! I appreciate it! Congratulations on making to the top 10 in the Love Your Lentils contest! I wrote a post giving a shout-out to finalists in the Top 10.